Nelson Mandela: The Official Exhibition is the major new global touring exhibition that takes visitors on a personal journey through the life of the world’s most iconic freedom fighter and political leader. 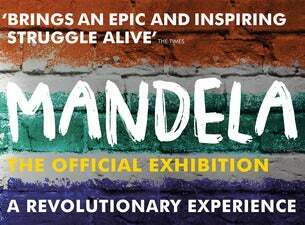 An immersive and interactive experience the exhibition features previously unseen film, photos and the display of over 150 historical artefacts and personal effects on loan from the Mandela family, museums and archives worldwide. Experience what growing up in rural South Africa was like from tribal chiefdoms to how Nelson got his name. What was apartheid and what did it mean for the people of South Africa? How did Mandela cope with imprisonment and subsequent release? Be inspired to carry forward Mandela’s legacy of peace and love.